Isn’t it the best time for upgrading your casual looks with the most subtle hairstyles? Be that pulled back pony, voluminous updo, or celestial braid you can always make it creative. Sometimes females don’t want to go for changes because they think that there is nothing better than their signature hairstyle. Well, if you want to keep your look mysterious and eye-catching then play with your locks, till you will get the best effect. Remember! People, who fear, will always lose their chance of having a trendy and stylish look. So I am here to help you in your choice and represent you 2016 best casual hairstyles. You will have some other hairstyles to wear for each day of the week. What do you think about voluminous hairstyles? I think they are impressive and can be worn casually too. First of all boost the volume and start braiding you hair. It is very easy to get a volume, just tease your hair with a proper comb and your desired volume will come out. If you are good at braiding then I advise you to opt for a fishtail. 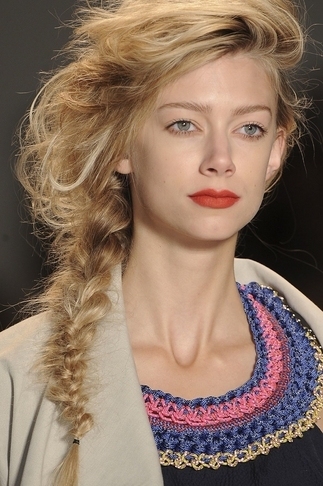 Add a little messiness to your fishtail and your delicious casual look is ready. Buns are everywhere! We can see bun included both in casual and classic styles. Since we are discussing casual hairstyles then this bun is casual too. How effortless buns are. Probably that fact fascinates us to wear it very often. So lightly twist your ponytail and get a bun then secure it with large French hair pins. This bun is complete with full bangs. Medium-length hair wearers will always gain because they may stay even without styling their hair. Since shoulder-length locks are neither long nor short they are not so irritating. Simply straight your hair keeping a little messiness and tuck your hair behind your ear. Believe me even with this simple casual hairstyles you will still draw attention. You can wear small braids on the beach. This easy braided hairstyle is possible to get within five minutes. So wave several sections of your hair and leave your curls flow gently down. If you have long fringe then braid it as well, in order to avoid falling hair. By the way, you can get curls with the help of hair iron. If you don’t like to tie your hair then don’t do it. Curl your hair then sweep it aside. Flattering side swept long hairstyles can be worn everywhere. Girls with natural curls are blessed; on the other hand modern technologies give you that chance to curl your hair easily.